Captain says he took alternate route to 'entertain' tourists on board. Francesco Schettino, the ship’s captain, was detained for alleged manslaughter, causing a shipwreck and abandoning ship with passengers were still on board. Schettino conceded he was trying to give tourists a better view of islands when the Concordia ran aground on rocks which slashed a huge hole in the ship’s haul, making it tilt to one side and causing it to sink. A French couple told reporters they spotted the captain in a lifeboat underneath a blanket well before anyone else had got into lifeboats. He could end up in prison for 12 years if found guilty. Meanwhile, sixteen people remain unaccounted for while rescue divers found 3 more bodies. Two dead elderly men were found in the ship’s restaurant, while another was found dead in an area of the ship that was still above water with a life vest on, dead from a heart attack. 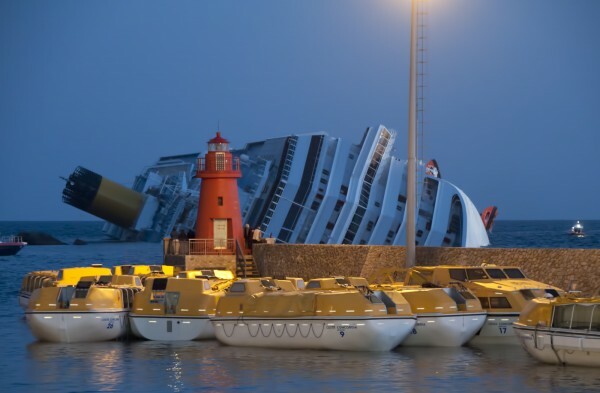 “While the investigation is ongoing, preliminary indications are that there may have been significant human error on the part of the ship’s master, Captain Francesco Schettino, which resulted in these grave consequences,” the statement said. Schettino has stated he took the ship an a diverted course different from the usual, calling it “touristic navigation” to entertain the passengers. Passengers that were on board the Concordia state the crew was disorganized and when asked for directions didn’t respond, stating the scene on board was chaotic at best. “It is becoming clear that the crew of the Costa Concordia acted bravely and swiftly to help evacuate more than 4,000 individuals during a very challenging situation,” adding that the passengers earlier took part in an evacuation drill. Residents of a nearby island stated they had never seen the Concordia come that close to shore in the past. No Americans on board the Concordia were killed. So What Are They Eating On That Carnival Cruise Ship While Getting Towed?